This is more of a personal testimonial that I am writing here, as a testament of the title of this entry. People often use religion as an I.D. Marker, rather than a philosophy to live by. However, as a born and raised Christian, and as I get older, I have come to appreciate and understand more and more the philosophy of Jesus the Christ. To be called a “Christian”, means that you follow the teachings of Jesus Christ, which involves setting aside the self, and to become selfless in service to members of humanity, and all within God’s creations. When one has truly come to understanding the teachings of Jesus, one will truly become convicted of them, and understand that what Jesus the Christ did by laying down His Life for the sake of all of Humanity, was not something that can be done by any living being; but can only be done by a Divine Being. God knew that the King of all Kings, and the Lord of all Lords, had to defy the earthly definitions and parameters of what a lord and king should be, in order to see the true meaning of what it takes to enter His Eternal Kingdom. Jesus the Christ, became the Ultimate Sacrificial Lamb/Offering, to the Holy Alter of God, the Father of Creation, in order to save Humanity from being lost forever from its Creator. Jesus the Christ reconnected what was once broken by Satan between Humanity and God, the Father of Creation, through His Death on the Cross at Calvary. Through His Death, Jesus the Christ also offered a Shield of Protection from receiving the same sentence that Satan and his minions have for rebelling against God, the Father of Creation, through the blood that He shed on the Cross upon His Passions and Death. This blood covering should be applied on everyday, as an armor; but only by those who have truly understood what Jesus the Christ did on the Cross, at Calvary. This understanding comes from faithfully seeking. God has promised that for all those that faithfully seek, will find Him and His Divine Laws of Love; and why Jesus the Christ had to do what He did, as He roamed this Earth. This knowledge is a gift from faithful seeking. Once Jesus the Christ died on the Cross, and said, “It is finished,” He permanently conquered Satan. Jesus the Christ crushed Satan’s plan to prove God wrong about His Most Prized Creation, Humanity. God is God. He is never wrong. How is a creation going to prove that its Creator is wrong? Satan knows that Jesus Christ conquered him at the cross, which is why he wants to keep as many people in the dark about Jesus the Christ. He wants humanity to be forever lost from the Unconditional Love that God, the Father of Creation, has for Humanity, and leave it blind as to how to enter the path that would lead Humanity back to the Eternal Paradise promised to them; to which Satan and his demons are no longer welcomed into. 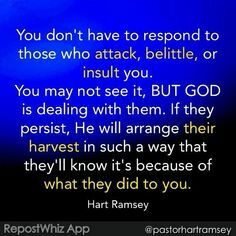 Satan also wants to discredit and make ineffective those of whom God has given the testimony to, which demonstrates His Existence amongst Humanity. However, Satan and his demons fear the very Name of Jesus the Christ, because even they have understood what He accomplished at Calvary’s Cross. Evil wants those that have the testimony to grow tired and weary of fighting against them, so that they will give in to their evil ways that rebel against God, and His Divine Laws of Love. A soul that has been touched by such wisdom angers the devil and his minions. Just by mentioning the very Name of Jesus will make satanic entities flee from you, whether you are encountering them while you are awake and wondering about during your day, or within the dead of night, in your dreams. God always finds a way to talk to His Children, and gives them the knowledge that they need to defeat His Foes. These are not only words, this is a personal testimony, as of pretty recent. My brothers and sisters I have been told to share this with you. Keep seeking God. Understand that when you call yourself a Christian, it carries the weight of being a brother and sister with Jesus the Christ. As human beings we are not perfect, but what separates us from others is that we see our imperfections, and know we have to repent for them to God, the Fatger, because He knows of the original greatness He created for Humanity to be. At the same time, we become targets of Satan’s envy for what he and his followers could never have again, the Eternal Peace and Love of God, the Father of Creation. Jesus the Christ gave us protection against evil’s tactics. By saying the very Name of Jesus the Christ, it will make them all fear of the Truth that Jesus has revealed to a soul that has understood what He did as He roamed this Earth, and accomplished through the Cross. They will flee from you, just by hearing this Holy Name of the King of all Kings, of the Most High Court, and tremble in fear of you. They will get angrier and angrier at the confidence you gain from knowing what Jesus Christ did. When Jesus the Christ said with His Last Breath on this Earth, as He hung on the Cross at Calvary that, “It is finished…”, it means that Jesus the Christ WILLINGLY took on His Calling to die for Humanity, to defeat evil from separating God, from His Children. He is not a lucky charm on a necklace…or a statue in a building….or even a mythological figure that is a “good man”. He became the Savior of Humanity, through His Selfless Act of Obedience to His Creator; and became the Ultimate Symbol of Unconditional Love. Understand what Jesus the Christ did, and you will have a tool that no one touch. God Bless, and may Jesus Christ find us worthy to enter Our Father’s Eternal Paradise to join Him and the Holy Spirit. This entry was posted in Testimony and tagged Blood Covering at the Cross, Blood Covering of Jesus Christ, Called Souls, Carrying your Cross, Devum, enduring trials, Evil can only imitate goodness, Faith, Fight over souls (good vs. evil), Fighting over souls, God's kingdom, God's Love, God's Promise, God's Wrath, Good vs. Evil, Holy Spirit, Humanity, Jehovah, Jesus Christ the Ultimate Symbol of Unconditonal Love, Jesus Christ's Blood Covering of Protection, Jesus Christ's Trials, Overcoming Trials through the Holy Spirit=God's Divine Tools for Ministry, Power in the Name of Jesus, religion, Satan Deception, Satan's Jealousy, Satan's Lies, SELFLESS LOVE, Take up your Cross, TRUTH, Ultimate Symbol of Unconditional Love, Yahweh, Yeshu Christu, Yeshua, Yeshuay on December 21, 2018 by foodforthespiritualsoul. What I have learned from the life and story of Jesus Christ is that evil will always make good appear as if it is evil….why you may ask? Well, for one simple reason…the moment that humanity knows and understands that there is a Higher Being, and that there is more to life than what we see, hear, smell, taste, and touch with the human senses (which is what evil can control to manipulate our perception), then it has lost its battle with Divinity. Once a person is truly awakened and enlightened, and recognizes that there is a soul that is being fought over…then there is no manipulation possible. In every holy scripture written, we see that God says His Ways are beyond the world’s ways. However, a way of life that follows the Divine Laws of Love (which consist of ways of Nonviolence, Unconditional Love, and Mercy) is what goes against the sinful nature of humanity, which was introduced by Satan in the Garden of Eden, to its first members of humanity (Adam & Eve). Humanity was not originally created to be violent, selfish, harmful, advantageous…etc. but to live in harmony with all of His Creations. Just as God knows the weaknesses and strengths of each person, so does Satan. The only difference is that God enhances the strengths of a person, while Satan enhances the weaknesses of a person. It is because humanity decided with their own freewill to give into their weaknesses, that we see the crimes against humanity and all of God’s Creations, today. Satan is only being given the opportunity to enhance such weaknesses. We allowed for evil to enter into our lives. Unlike Satan who forces his ways upon our weaknesses, God gives us the choice to choose His Ways of His Divine Laws of Love, or to fall prey to our weaknesses. God’s Unconditional Love for Humanity extends to the point that He gives us a new slate each day we wake up, to use our freewill again to again have the opportunity to make the choice is following His Divine Laws of Love or not. However, He makes it clear that His Divine Laws of Love do not conform to the ways of this world, but are beyond them. Just as He showed us through Jesus Christ, His Son, as He roamed this earth, and many of those that took Him as His Life Example, is that whatever is considered poor, meek, mild, childlike, innocent, and against the grain is considered to be what is favorable in the Eyes of the Almighty God, and entrance into His Eternal Kingdom. Evil will try to convince those that are conformed to the ways of this world that such ways are weak, undesireable, low of standards, stupid, and even unbelieveable. Those who have allowed for evil to take foothold into their lives will hate such things because it goes against what an earthly shackled mind can comprehend and understand…it goes beyond what evil can understand. This is what Jesus Christ and His Followers provided to the world. Such an Eternal Kingdom does not define its richness in gold, silver, cars, homes, money or earthly possessions, but by the riches of the heart, mind, and soul. God gave us Jesus Christ as the Life Example for many reasons. He understands that humanity needs to see, hear, smell, taste, and touch things to be convicted of a way of life, to see and perceives things. Jesus Christ was that example that God, the Father of Creation, provided for Humanity, so that they can see His Unconditional Love for it. That despite what evil may throw in a life bound to the Eternal Kingdom, it will only follow the Divine Laws of Love, at all costs, even to the point of death to the earthly body. Because it is not bound by the earthly things…but bound by the eternal….therefore the earthly body…though beaten bruised and broken…the soul lives on…free…for eternity. It does not cause harm, even to those that cause harm to it. It choses to love, rather than hate; and whatever it can not do, puts it into the Hand of God, the Father of Creation, to provide the strength it needs to follow His Divine Laws of Love. Such a soul does not act out of the human will that has been tainted by satan and his demons; for it will be pricked and even tortured for going against its true calling towards the Eternal Kingdom. God makes those connections forever, once a soul seeks Him and His Divine Laws of Love, and are forever bound to them, in ways of Nonviolence, Unconditional Love, and Mercy. Evil does not know how to control such a soul. Such a soul has used its freewill to seek the Divine Laws of Love and the ways of the Eternal Kingdom, and unshackled its sins by abiding by the Divine Laws of Love. It knows no other way to live. Evil will try to discredit such a soul, in order to prevent such enlightenment to spread, and therefore makes its efforts less influential on the majority. It needs to make them look evil, because there is a natural tendency for humanity to be deterred by evil. Do you think if evil showed its true face and intentions that humanity would have come as far as it did with all the crimes against creation and humanity that has occurred? No. Absolutely not. Evil has to make itself appealing and convincing that its ways are not harmful; and make the Divine Laws of Love, unnatural….evil…and even wrong. God knows He will win in this battle…however at the same time, He wants true believers in the Eternal Kingdom…so He wants us to be just as sure as He is in His Divine Laws of Love. This certainty will come with pain, sacrifice, and persecution because of the discrediting of evil….but in the end…eternity is promised to those that are loyal to the Divine Laws of Love…so how strong is your faith these days? This entry was posted in Thoughts and tagged A call to help fellow man, Armor of God, Battling Evil, Christ, compassion, Devum, discernment, Divine Laws of Love, Earth, enduring trials, Evil, evil ways are temporary, Faith, Fight over souls (good vs. evil), Fighting over souls, God, God's Divine Laws of Love, God's Love, God's ways are permanent, God's Wrath, Good vs. Evil, Jehovah, Jesus and His Crucifixion, Justice for "the Just", Overcoming Trials through the Holy Spirit=God's Divine Tools for Ministry, Path to Truth, Persecution, Satan's deception, SELF LOVE vs. SELFLESS LOVE, Self Refinement, Spiritual Battles, Steadfast Faith, Take up your Cross, Unconditional Love, Yahweh, Yeshu, Yeshu Christu, Yeshua, Yeshuay on December 15, 2016 by foodforthespiritualsoul.